The Alliance has organized Mendocino County Vendor Connect to include all telecommunications vendors who currently do business in Mendocino County, or those who are interested/should be interested in doing business in Mendocino County. This includes both middle‐mile and last‐mile providers. 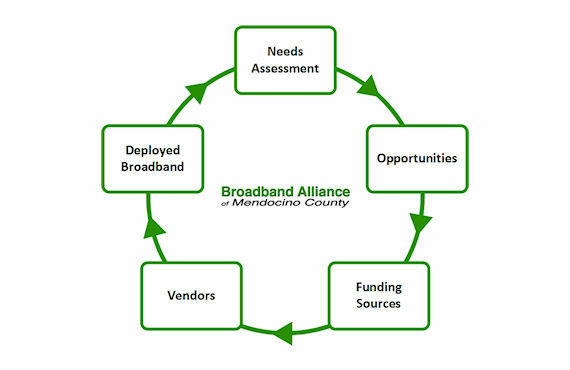 Through its Notices of Opportunity program, the Alliance has formalized the cyclic process of identifying broadband access need, quantifying need as an opportunity, identifying funding sources, facilitating vendor grant application, expediting broadband deployment, and repeating the cycle. On an ongoing basis, the Alliance distributes notices of opportunity (NO) to Vendor Connect. Notices of opportunity are intended both to identify opportunities, and to facilitate vendor evaluation of, and grant application for, each opportunity. For each notice of opportunity, the Alliance will compile data for the opportunity, including that needed to submit CASF broadband deployment grant applications. The Alliance makes an investment in maps and data whose benefit is spread across all vendors in Vendor Connect. Vendors need not make speculative investments in mapping and data to evaluate possible opportunities, and can concentrate instead on figuring out how to make a viable, fundable, business case, or determine that no business case can be made in the current funding/economic situation. Notices of opportunity that fail to result in broadband deployment will be put into a special data base for subsequent analysis. 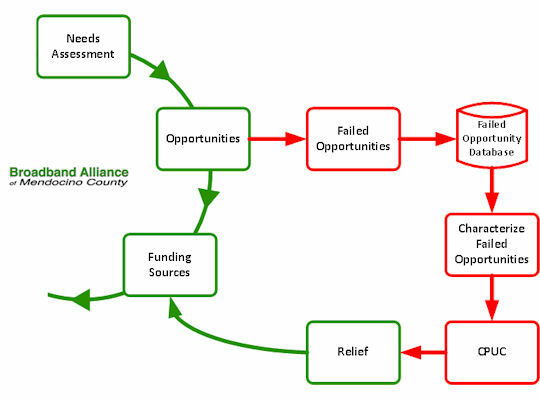 The failure database will serve as a case study investigating the root causes of failure to eliminate unserved and underserved areas of Mendocino County. Since each notice of opportunity includes the official CPUC data for the affected area, the Alliance will be able to formally characterize areas that remain unserved or underserved in the current funding/ economic state. Such analysis can be used by the CPUC to devise changes that could lead to elimination of unserved/underserved areas in Mendocino County, and throughout the State of California.